Lemon is one of my favorite flavors (second only to chocolate), and these little cakes are adorable. Love the limoncello glaze! In another small bowl, stir together the yogurt and the milk just until smooth. In a stand mixer, using the paddle attachment, cream together the butter, sugar, and lemon zest for about 5 minutes, until smooth and light. Stop to scrape the bowl periodically. On low speed, add in the flour mixture alternately with the yogurt in three additions. Mix just until incorporated. Increase the speed to medium and mix for 2 minutes more, until the entire mixture is smooth and light. Add in 3 Tbsp. of the lemon juice and 1 Tbsp. of the limoncello. Blend just until evenly mixed, no more than 30 seconds. Portion the batter evenly into your pan(s); smooth the top of the batter. Bake until the center of each cake springs back when pressed lightly with a finger, and a toothpick inserted in the center emerges clean. This will be about 15 minutes for mini-bundts or cupcakes (if making minis or cupcakes, don't wait for the exposed part of the cake to look golden brown; golden around the edges is enough). If you've made the cake in mini-bundt pans, let them cool for about 10 minutes before inverting the pans onto a cooling racks to remove the cakes. If you've baked cupcakes, give them no more than about five minutes in their pans before carefully removing to a cooling rack. To make the glaze, mix the confectioners' sugar, 2 Tbsp. of lemon juice and 3 Tbsp. of limoncello in a small bowl and stir until any lumps are completely gone. If you'd like the glaze thicker, just stir in a bit more confectioners' sugar until it's the texture you prefer. 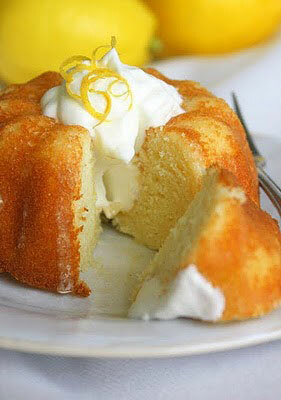 If you like, serve each cake topped with a little unsweetened whipped cream and some lemon zest curls. Yummy.